Just curious what the opinion is on The Panelák. I have always been fascinated by areas such as Jižní Město (Prague) and Petržalka (Bratislava). The town of Most is practically one big panelák housing estate. It stuns me the number of Westerners who visit Prague and never realize that such places exist. All they see is Prague 1 and 2, and fail to realize that those two areas are by and large playgrounds for tourists. Opinions or information would be greatly appreciated. I would agree that viewing the monotony of such panel suburbs can be quite a fascination. In my opinion however, the somewhat "eye-sores" that you find within the transition zone and outer areas of Prague (CR) and Bratislava (SK) are considerably of better quality than what you may find in Eastern Bloc countries (Romania, Ukraine, Latvia...), or even in suburbs such as Wan Chai in Hong Kong. Density and congestion is also a lot higher in these places too. I find it quite depressing to see how people can live in such cramped, ugly, concrete laden, perfect rectangle monstrosities (ul. U novych domu - a prime example). I do enjoy viewing such buildings though, probably because it is essentially non-existent where I reside, but also because of the reminiscence of soviet-days that seem to infiltrate my mind. Last edited by Ladis on 20-Nov-05 9:32, edited 1 time in total. Does anyone know if there is a database (register) that lists such communities? If not, I may try to build one myself. I would want to include the history of each community, population numbers, average size of residences, photos, and so forth. Yes, I would agree that the housing estates in CR and SK tend to be of a much higher quality than what you might find in many Eastern European countries. One exception might be some of the areas that the Gypsies have taken over. Some of these areas are beyond belief. I have never been to Hong Kong. It kinda surprises me to hear that there are such areas there. I have always thought of Hong Kong as being a wealthy area. I would be interested in seeing how much a residence there costs in comparison to a similar residence in CR or SK. I would suspect that the price would be much higher in Hong Kong. This brings up something else I am curious about. How much would a typical residence in one of these housing estates go for? Lets say something by the Haje Metro stop in Prague. I have been to Ukraine (a fantastic country in my opinion) and did spend a bit of time in some of their urban housing estates. It is important to remember that Ukraine is a very poor country ( http://en.rian.ru/business/20050801/41069723.html comparison of average monthly salaries). This is especially so when you get out of Kiev and visit some of the smaller towns. Conditions are MUCH better in CR and even SK than they are in Ukraine. However, please don't let this stop anyone from visiting this fascinating country. Thanks for the picture. A pretty girl and paneláky. Do you mind telling me what area this is? If you have anymore pictures I would love to see them [with or without girl(s) ]. We have many such buildings in France. We call them HLM (habitation à loyer modéré). The oldest date back to the 1970s. The concrete panel houses are in Western Europe, too. Maybe you remember the disaster in London East End in 1968. 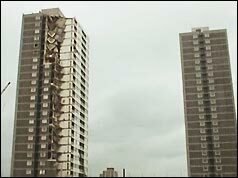 A corner of Ronan Point collapsed after a gas explosion. Last edited by Zeisig on 22-Nov-05 10:20, edited 1 time in total. I believe there is a huge difference in the French/UK version and the Eastern European version. In France and the UK these areas are mainly filled with poor immigrants. In Germany you can find the same. The German government built such places for many of the Turkish workers who moved to Germany. The CZ versions are much more massive, filled not with poor immigrants but with average Czechs, and are the result of some sort of communist utopia where every man was supposed to be the same. 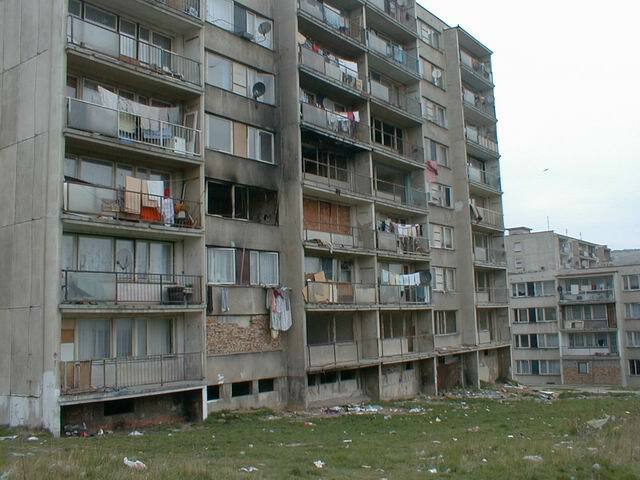 Trust me, if the average resident who lives in such housing in CZ had been born in France or the UK, they would not be living in similar housing. This is one of the things that interests me about the areas. They seem to be one of the strongest reminders of the old communist regimes. I believe that last picture is a Gypsy area. So, if you had something stolen while in CZ you can probably find it in there.